This past week I've been obsessing over white flowers, though as we don't have a garden here I don't have fresh flowers on tap so have to buy them whenever I feel the need which can get a little pricey. I didn't seem to have the right shape of vase for these daisies so I used a spare jar I picked up from Age UK for 50p and I like the effect. Little espresso cup and saucer for £1, admittedly I don't have a coffee machine . . . and I don't drink espresso very often either - but I couldn't let that get in the way of a cute purchase! Not my usual sort of buy but the moment I clapped eyes on this pewter tankard I knew I needed to fill it with flowers, it's engraved M.B and was only £1. I have a habit of dropping and cracking vases so having something that bounces is a winner! Yet another hanging heart to add to the growing collection around the house, this one wasn't a thrifty purchase at £1.50 but it was the perfect little heart for one of the bathroom cupboards and I wish I'd bought a couple more when I saw them as they'd make lovely gifts. My favourite find though was this little bundle of Queen Anne china, one large plate, six tea plates, a sugar bowl and a milk jug all for £4 from the British Heart Foundation. It's such a contemporary looking pattern so I've no idea as to when it was produced but I'm going to have to find space somewhere to display the jug as I love the colours and it feels really summery. I am so enjoying your blog Jem!!! Goodness, what adorable finds! 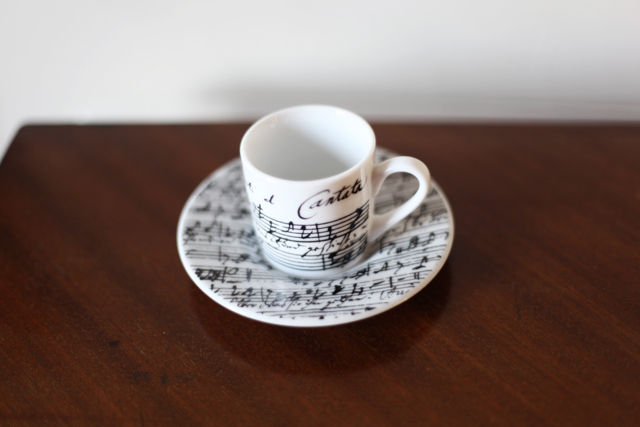 I just love the tiny cup and saucer! Lovely images,I too am hankering after fresh flowers at the moment, must be a Spring thing! 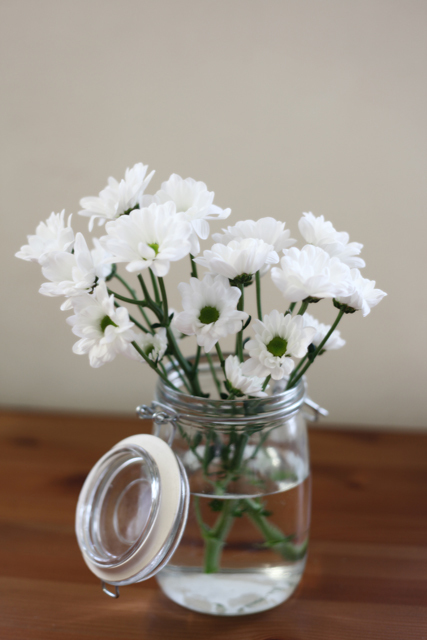 Your buys are great, I love the jar with the flowers in, so simple but classy! am i in heaven?? i see lots of white and i love it!! i know how u feel about the price of flowers, i dont get them very often either but those daisies are gorgeous in a perfect jar! love the jar! i dont drink espresso often but that cute espresso cup is so sweet! 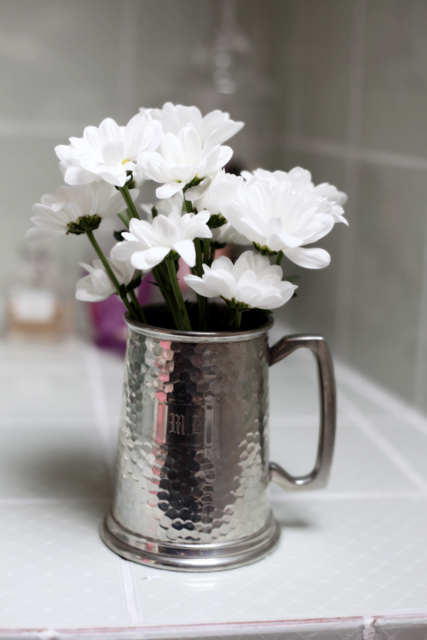 i think the tankard pewter is lovely, must be the daisies effect as well but i love the initial on it! 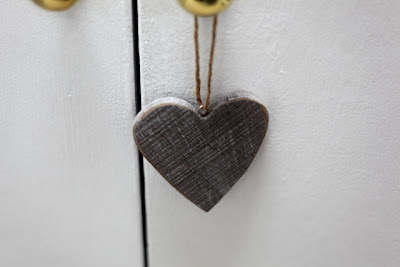 i could never get enough of hearts hanger, especially wooden hearts, be still my heart! 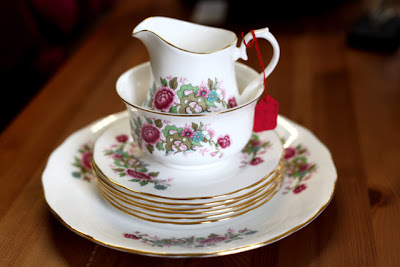 last but not least, my fave of all, the queen ann china teacup, oooooohhhhh love it!! Hey honey, gorgeous post as always, so jealous of you and the things you manage to find! Sorry about the delay in your letter, I have been so busy!! I shall send it off on Monday when I go to the post office to send off the prize to my giveaway winner! These are all fun finds! I especially like the Queen Anne china pieces. Happy Show 'n Tell Friday! Fabulous finds - everything is so lovely. I'm your newest follower. Hope you can come over & say hello: http://www.SallyLeeByTheSea.com. Thanks for your sweet comment on my blog. I couldn't respond to you by email because my computer died. I LOVE the pewter pitcher. Adorable!! Content on Beautiful Clutter is copyright of Jem Cope unless otherwise stated/credited. No stealing please!